Jose Mourinho said this week that Eden Hazard is better than Cristiano Ronaldo. We’ll call that Thing One. The planet Earth came into being 4.5 billion years ago when the core of the solar nebula collapsed to form a star, causing debris in the resulting gravitational sphere to accumulate into planets. We’ll call that Thing Two. Thing One agitated people. Writers wrote about what Mourinho said. People who know how to make graphs on their computers ran to their computers to make graphs, proving or disproving (although almost always disproving) his claim. Stern men on television discussed the matter sternly and at length. The logic of Mourinho’s position was strange — essentially, he said that since Hazard was the best player on Chelsea, and since Chelsea won more trophies than Ronaldo’s Real Madrid, and since players need to win trophies to validate their skill, then Hazard must be better than Ronaldo, even though by every traditional measure Ronaldo is not only better than Hazard but gigantically, monumentally better. But the position did have a logic, which meant that the logic had to be refuted, which opened up all sorts of opportunities for low-grade confusion and misunderstanding, media people thinking themselves into knots, etc. And a quiet tone of grievance fizzed beneath the whole conversation, because he’s always doing this, isn’t he, Mourinho; he’s always saying things you know he doesn’t mean and saying them just well enough that you have to go online or in front of a camera and take them halfway seriously, even though you know he’s laughing at you the whole time. Thing Two, meanwhile — the existence of the planet — continued to elicit almost no commentary whatsoever. Which is strange, if you think about it. After all, no sports debate exists outside the world, even if the whole genre of sports debate sometimes seems to take place in its own universe. The well-known ex-striker who is knitting his brows and saying, “But for me, Mick, Ronaldo will always be a champion” — he may be inhabiting a studio that looks like a Gillette commercial broke out inside a Star Destroyer, but he’s also being broadcast into living rooms and atrociously named Irish pubs and mobile apps that crash just when you get them working. Nine of him are flickering in a grid in the electronics-store window, where a woman out walking her dog is passing at twilight, thinking, God, what a bad day at work but at least the city is still beautiful. These messages go out into the world. They become part of everyday reality. They are reflected across it in all sorts of fascinating ways. In life-on-earth terms, though, what does it mean for Mourinho to tell the media that Eden Hazard is better than Cristiano Ronaldo? What does it mean for us — the vague, pointillist us of columnists, made up of millions of overlapping but discrete perspectives — to care? It’s tempting to say nothing. Like most Mourinho-driven controversies and most offseason debates, and in fact like almost everything that happens in European domestic-league soccer in July, the Hazard v. Ronaldo content brush fire comes equipped with a self-extinguishing uselessness. No one will remember this micro-scandal in December. Mourinho won’t even remember it.1 Still, the answer isn’t nothing, because too many people do care, or at least perform actions suggesting a caring-adjacent involvement. They click a link. They press play. They feel a momentary rush of something interesting. I myself am so uninterested in Jose Mourinho’s sauna-hot Ronaldo takes that it’s all I can do to crawl out of bed most mornings, yet I did every one of these things, some of them twice, and wound up fairly cheerfully thinking, Screw it, I don’t care if Ronaldo’s better, it would be fun to build a team around Hazard. So … let’s break it down, I guess? OK. From Mourinho’s angle, what this is about is … [struggling] … or then if you consider the advertising economy, websites have to … [sliding out of my chair] … whereas in the offseason fans probably get a dopamine rush just from … [lying on the floor waiting for cats to eat me]. You know what? I can’t do it. Let’s talk about Eden Hazard for a second instead. What a wonderful footballer. I don’t, truly, know what it is that we’re doing with sports, why something so seemingly arbitrary should dominate such a huge swath of culture.2 But I do love watching him. He did this just this week. He has that quality of sped-up, borderline manic calculation that you sometimes see in players who can do everything. Some footballers — Andrea Pirlo in his prime, say — seem to disappear into games, materializing only a split second before the devastating pass. Hazard is the opposite; he’s intensely visible. When he’s moving on the ball, feinting, looking, rolling, backing into one defender and spinning around the next, what you’re watching is someone thinking out loud, testing and rejecting possible futures until the right one opens up. Pirlo made the game magical because you couldn’t see what he saw; Hazard makes it thrillingly accessible because you almost can. You watch him like oh! there! no! that! now! — and then suddenly he’s thunderbolting the ball into the net from 20 yards, or going on a shearing run through half the opposing defenders. 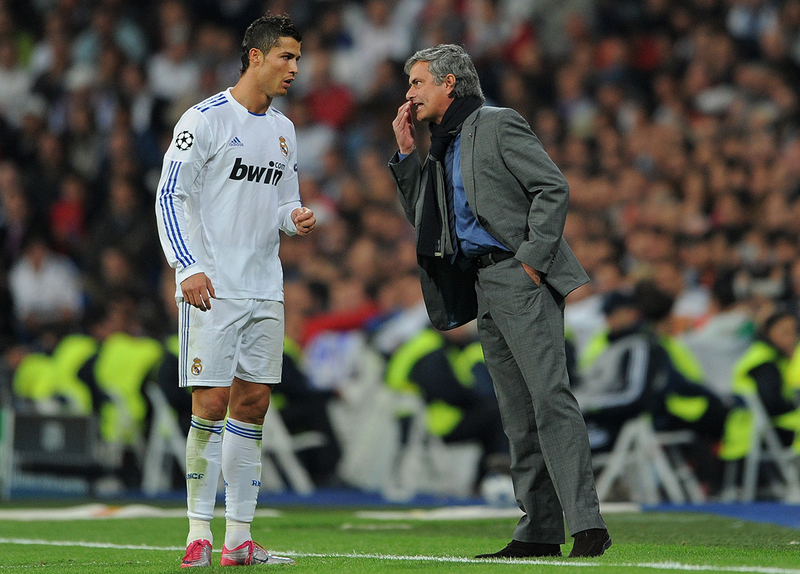 Jasper Juinen/Getty Images Ronaldo and Mourinho in 2010. That he does this from the left wing for a team coached by Jose Mourinho only makes it more incredible. I don’t want to disrespect the memory of Juan Mata by implying that Chelsea is a boneyard for creative-minded midfielders, so let’s just leave these roses on his tomb and back away. Mourinho’s teams thrive on creativity, but in the same way that cars thrive on gasoline: by hiding it deep under the surface and trying to expend as little of it as possible. Mourinho likes his soccer, unlike his press conferences, to be played with restraint. And then here comes Hazard, spin-wobbling across the pitch like the feral embodiment of his own name. Somehow the tension works. The German philosopher Theodor Adorno, in a really pretty terrible meditation on jazz, once accidentally offered the perfect description of Mourinho’s tactics. “Art is permitted to survive,” he wrote, “only if it renounces the right to be different, and integrates itself into the omnipotent realm of the profane.” The omnipotent realm of the profane — has anyone ever said anything better about Roman Abramovich’s Chelsea? Art (i.e., the sort of soccer that doesn’t revolve around sound defensive positioning, the sort that’s, um, fun to watch) survives only if it integrates itself into the system (i.e., tracks back whenever possible and nods crisply after securing the 1-0 win). The realm of the sacred may be pretty, but it’s the profane that brings home Capital One Cups. Yet instead of renouncing the right to be different, Hazard has thrived by doubling down on his difference, insisting on it. He’s the forward-moving point of an army that wants to move backward. He plays for Chelsea like a strange wind that has blown in from Arsenal. Except, you know — he keeps winning. And this has nothing to do with Cristiano Ronaldo, who scored, going by memory, 473 goals last year, and who has scored 22 already today, and who is just in general an unstoppable phenomenon of hydraulics and inspired malice. The worst thing Mourinho’s sound bite did was open up the opinion-space in which we’re forced to consider the question of who’s better, because of course Ronaldo is better — and will be until he’s either too old to compete or finally dies in a tragic Speedo accident. But the only reason to make the comparison is that a clip in the media blipped onto your screen and told you to. These tempests of opinion-space seem to have such urgency in their sealed-off reality. The upcoming-topics sidebar says DEFLATEGATE: HOW MANY GAMES? and an angry man is pointing at you and the Cubs score is sliding across the crawl and lasers are forming interlacing webs on the screen within the screen. But of course this is neither urgent nor sealed off. If you follow sports, you are being bombarded with it all the time. Our (“our”) lives just accommodate it, which is what’s so interesting. The border has been blurred out of existence. You are reading a book or eating a taco and in the corner of your eye this loop is running that feels kind of like sports but isn’t, even though it uses the same words. We want to hear those words, I guess, which is why we press play in the first place. And maybe this adds something to our experience, and maybe it doesn’t, but anyway we keep doing it. But your thoughts zoom up and out. What does better mean, anyhow? After a while, the writers shut down their laptops and go sit on the balcony with a beer. The well-known ex-striker sponges off his makeup and wanders out to the parking lot, where it’s hot, too hot to wear this damned tie, and he forgot to remote-start the BMW again, which means waiting for the thing to cool down in traffic, and at this hour, Christ. Eden Hazard, the real person, is somewhere in the world, doing something, and so is Cristiano Ronaldo, eating cereal or laughing at a movie. The ex-striker loosens his tie. The satellite completes its orbit in 23.93 hours, the same rate as the rotation of the earth. Mourinho, in fact, is already waist-deep in his next controversy, this one involving an increasingly amazing beef with Rafa Benitez’s wife. Don’t misunderstand me; sports can be beautiful and can be an engine for strong feeling. I just mean arbitrary in the sense that where the 19th century was preoccupied with novels that commented directly on society and the human condition, we are preoccupied with dudes in bright shirts kicking balls at a net several times a week.